Morris Brandon Elementary School, 2741 Howell Mill Rd., was built in 1947, and is notable for its Art Deco facade. E. Rivers Elementary School, 8 Peachtree Battle Ave. The present school was designed by Stevens & Wilkinson in 1949 and featured in TIME magazine for its innovative International Style. 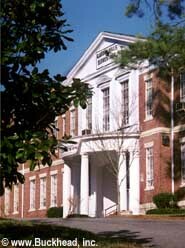 It replaced Peachtree Heights School, which opened in 1917 and burned in 1948. Eretus Rivers developed Peachtree Heights Park and donated the land for the school. Sarah Smith Elementary was named a 1998-99 National Blue Ribbon School by the U.S. Department of Education. The Blue Ribbon is the department's highest recognition and honors the school's quality of leadership, curriculum, student achievement, parent involvement and community support. North Atlanta High is a double Magnet School. The School of International Studies and the Center for the Performing Arts are two of the most outstanding programs offered by the Atlanta Public Schools. Galloway School at 215 West Wieuca Road once was one of two Fulton County almshouses established in 1869 for elderly indigent citizens. Vegetables for the almshouses and the Fulton County Prison Farm were grown on the present-day Chastain Park golf course across the street. The almshouses closed in the early 1960s, and Galloway School opened in 1969. Atlanta International School, 2890 North Fulton Dr., was designed by architect Philip Shutze and is on the National Register of Historic Places. Pace Academy, 966 W. Paces Ferry Rd. 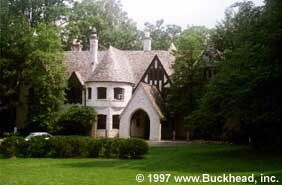 was the home of the Randall family, whose ancestors included Hardy Pace, for whom Paces Ferry Road was named. The family lumber company has served generations of Atlanta renovators and builders. Northside Metro Children's Tuxedo Center, 4191 Northside Dr., 30342, (404) 233-7828, diagnostic and treatment services for children ages 3-21 with severe emotional or behavioral problems.